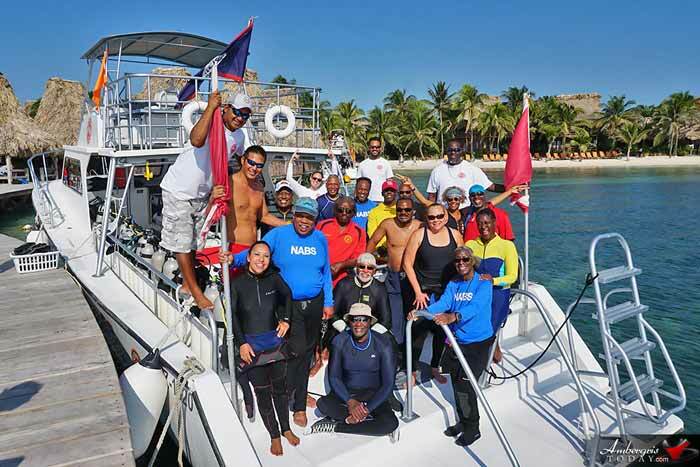 They have been coming to Belize for 30 years now, bringing scuba divers from all over the United States and this year, during their 27th Annual Summit, the National Association of Black Scuba Divers (NABS) organized a trip with 106 scuba divers who enjoyed a week-long stay in San Pedro, Ambergris Caye, Belize. All divers came to San Pedro and booked out Ramon’s Village that catered to their accommodations, diving and extra curricular activities. Every year NABS organizes a dive summit in different locations in the Caribbean and Bahamas; this is NABS’s 27th Annual Summit. Being a great friend to Belize, Dr. Jose Jones (co-founder of NABS) was delighted to once again bring the summit to the country. NABS is comprised of dive clubs from around the United States, which includes 20 active clubs and 3,000 chartered members. The Summit gives the opportunity to new and old members to experience exotic dive locations, taking tourist revenue to all destinations visited. There was no shortage of dives for the big group as the summit provided three dive on a daily basis, visiting the popular local dive spots on Ambergris Caye and surrounding areas, including dives at the Great Blue Hole, Turneffe Atoll and special night dives. Auxiliary divers of Aqua Corp provided safety and training in addition to the professional dive masters at Ramon’s Village Dive Shop.